A 27-year-old man of Middle Eastern descent presented to the hospital after waking with severely reduced visual acuity in his left eye. Several months before presentation he had experienced an episode of reduced visual acuity in his right eye that had slowly resolved over several weeks. The patient had a history of long-standing recurrent oral–labial aphthae, intermittent painful swelling of his knees and ankles, low-grade fevers and night sweats. On examination, the patient was afebrile and had normal vital signs. An oral–labial aphtha was present (Fig. 1). His visual acuity was 6/60 in the left eye and 6/6 in the right. 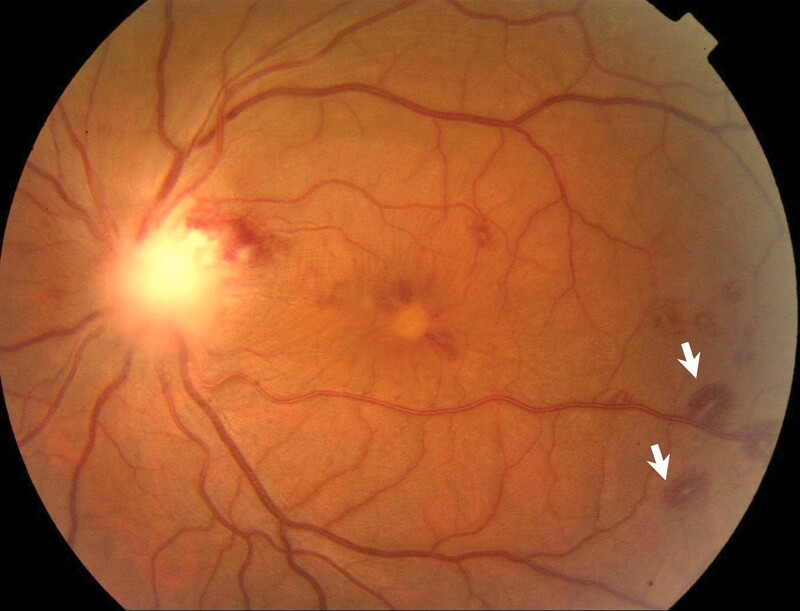 Funduscopy revealed disc edema and retinal vasculitis, shown by superficial retinal hemorrhages with pale centres (Fig. 2). Anterior uveitis was noted on examination with a slit lamp. The patient also had erythematous plantar maculae (Fig. 3), effusion in his right knee and scattered pseudofolliculitis. Fig. 2: Retinal hemorrhages with pale centres. Fig. 3: Erythematous plantar maculae. The results of blood counts and serum tests were normal. The C-reactive protein level was elevated at 123 (normal < 5) mg/L, as was the erythrocyte sedimentation rate at 35 (normal < 10) mm/h. Results of serologic tests, including those for collagen vascular diseases, were normal. Thoracic, lumbar and sacroiliac radiographs were unremarkable. Results of arthrocentesis were consistent with an inflammatory arthropathy. Results of an echocardiogram were normal. Fungal, viral (including HIV), bacterial and spirochete cultures were negative. Tuberculin purified protein derivative and pathergy skin testing also yielded negative results. The patient was positive for the HLA-B51 antigen. A skin biopsy revealed evidence of vasculopathy, including swelling of endothelial cells and perivascular inflammatory cell infiltrate (Fig. 4). Behçet's disease was diagnosed. Fig. 4: Endothelial cell swelling (black arrow) and perivascular inflammatory cell infiltrate (white arrows). The patient received no specific therapy for Behçet's disease, and after 4 weeks all symptoms had completely resolved. 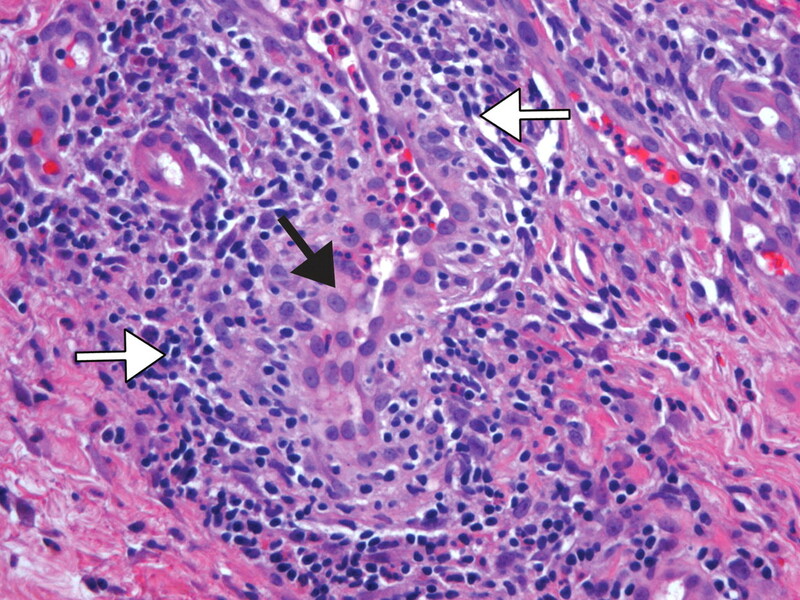 Behçet's disease is an inflammatory disorder, with recurrent attacks of acute multisystem vasculitis.1 Prevalence is highest among people of Middle Eastern or Far Eastern ancestry. Diagnosis of Behçet's disease is based on clinical criteria in the absence of alternative clinical explanations. Several sets of criteria have been proposed, but the most widely accepted are those of the International Study Group for Behçet's Disease.2 According to their criteria, recurrent oral ulceration must be present as well as at least 2 of the following: recurrent genital ulceration, eye lesions, skin lesions or a positive pathergy test result. (In pathergy testing, a sterile 20–22-gauge needle is used to obliquely pen-etrate a vascular skin to a depth of 5 mm; the result is considered positive if an erythematous papule develops at the test site after 48 hours). Although Behçet's disease is perhaps less familiar to North American physicians than to those practising in the Middle or Far East, it is often included in the differential diagnosis for cases that are difficult to solve and involve multiple organ systems. Our patient's case illustrates several classic findings of Behçet's disease as well as the importance of a thorough history and physical examination. Sakane T, Takeno M, Suzuki N, et al. Behçet's disease. N Engl J Med 1999;341:1284-91.
International Study Group for Behçet's Disease. Criteria for diagnosis of Behçet's disease. Lancet 1990;335:1078-80. Saenz A, Ausejo M, Shea B, et al. Pharmacotherapy for Behcet's syndrome. Cochrane Database Syst Rev 2000;(2):CD001084.